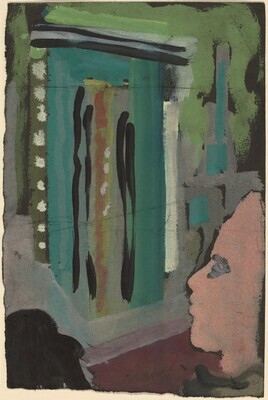 "The Art of Mark Rothko: Selections from the National Gallery of Art, Washington", State Museum of Art, Riga; State Hermitage Museum, St. Petersburg, 2003-2004, as Untitled (figure staring at a doorway). "The Art of Mark Rothko: Selections from the National Gallery of Art, Washington", Museo de Arte Moderna, Mexico City; Hong Kong Museum of Art; Leeum, Samsung Museum of Art, Seoul, 2005-2006. Borchardt-Hume, Achim. Rothko: The Late Series. Exh. cat. Tate Modern, London; Kawamura Memorial Museum of Art, Sakura, Japan. London, 2008, fig. 31.